The discovery of an old wooden canoe frequently leads to a question about how many of this model were made. The top thirty five most popular wooden canoe models from the Old Town Canoe Company are listed below. These estimated totals are based on the information from the WCHA's Build Record Archive Project. These records are only from 1905 to 1979 so information before and after those dates could not be included easily. 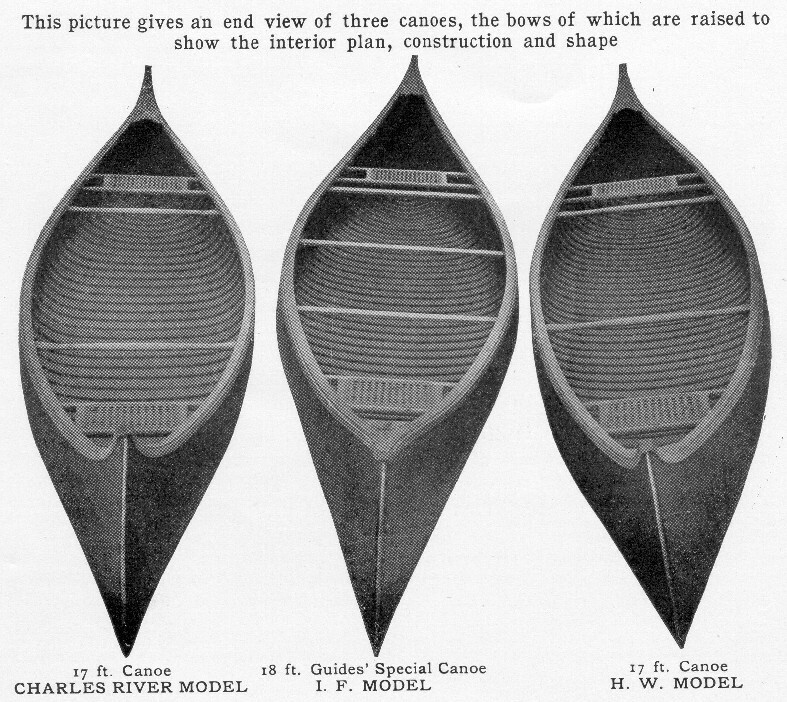 Some interesting changes in the economics of canoe production are shown by this analysis. There were an estimated 5072 examples of the eighteen foot Charles River model built in the twenty two years between 1906 and 1927 with an average of 231 per year. There were an estimated 4026 examples of the sixteen foot FG (fiberglass) model built in the ten years between 1966 and 1975 with an average of 403 per year. There were an estimated 5085 examples of the sixteen foot ABS plastic Chipewyan model built in the four years between 1972 and 1975 with an average of 1271 per year. More information about the Archive Project can be found at http://www.wcha.org/catalogs/old-town/records/. The news release from the Old Town Canoe Company about their millionth canoe offers some additional perspectives comparing canoe and kayak production. Old Town issued about 95,000 serial numbers in the 23 years between 1906 and 1929. This represents about 4,130 wooden canoes per year. It took about 45 years to issue the next 100,000 serial numbers. This was a mixture of canoes and boats in wood and plastics averaging about 2,222 units per year. They issued serial number 500,000 in 1995. These were primarily plastic canoes averaging 14,286 per year. Their millionth serial number was issued in 2003. They are focused on plastic kayaks now and this represents an average of 62,500 per year. All items contained within these pages are Copyright © 2004, The Wooden Canoe Heritage Association, Ltd., and/or it's members. Permission to reproduce this material in any manner must first be obtained in writing from the WCHA, or the author/owner of a specific item.